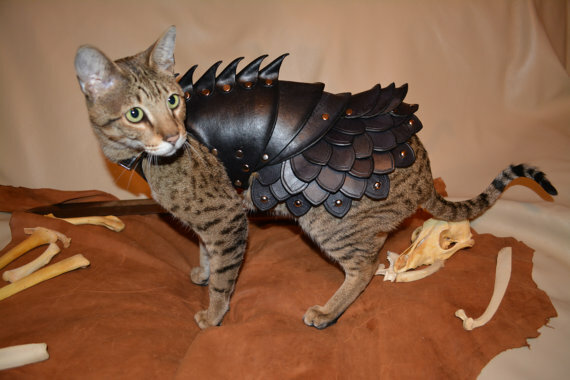 Home » Goth & Steampunk » Cuteness Warning: Armour for Your Cat!? Yes, you read that right! 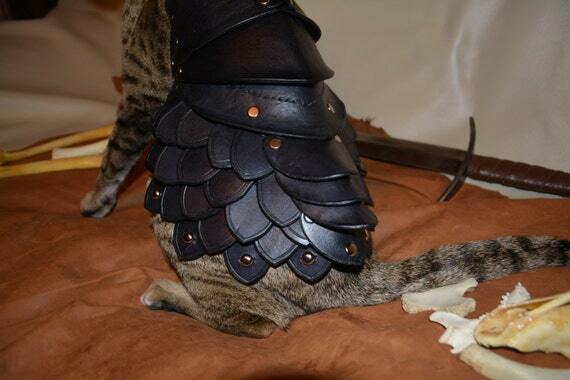 An Etsy seller has shot to fame with this impossibly cute yet oh so awesome design of LARP armour for cats! “100% wearable, flexible, and comfortable, the Cat Battle Armor is a for-reals armor harness for your kitty,” said the maker, Savage Punk Studio. “Completely handmade from durable veg-tan leather, this is no mere costume piece. Your cat will become an unstoppable force for slaughter in this fully articulated suit, shielding them from foes while allowing unimpeded movement across the battlefield or living room floor. The imposing torso section features several riveted, articulated plates and a terrifying rack of dorsal spines. Your cat’s hindquarters are sheathed beneath exquisitely arrayed overlapping scales stitched to a soft leather backing, adorned with nickel silver dome rivets. Midnight black scales and plates are finished with a glossy protective coat and seamlessly join together like the petals of a deadly flower. Adjustable at the collar with elastic and two nickel silver buckles, and at the belly with grommeted corset-style lacing for a secure, comfortable fit.” Next time your seat is taken get ready for a Game of Feline Thrones, although the seller does warn however, for anyone thinking otherwise, that this is an aesthetic piece rather than a genuine safety precaution. 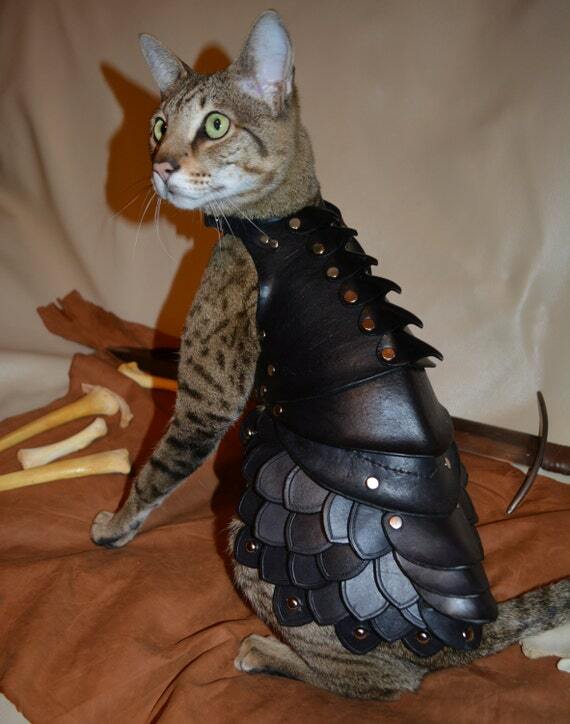 Anyone concerned about what Selani the cat thought about her LARP armour can relax. Apparently she had a lengthy bespoke fitting that most of us can only dream of. “While we were constructing the armor, we made sure Selani was around to get used to the look, feel, and smell of it, and gave her positive reinforcement through extra petting and treats when she approached. When we put it on her, we did it gently and over a long period of time, cuddling her in our laps and letting her move away whenever she wanted. Using force or physically restraining her would have been very counterproductive- we just had to be patient, and reward her when she helped out,” said Savage Punk Studio. These are of course wise words for any other outfit you intend to make or buy for your pet. The page also says it welcomes commissions for armouring other animals! The $600+ price tag is a slight downside or else parks would be full of LARPing pets! Of course if you would rather reserve money and glamour for yourself then Savage Punk Studio also offers a very Steampunk human-sized harness in leather. 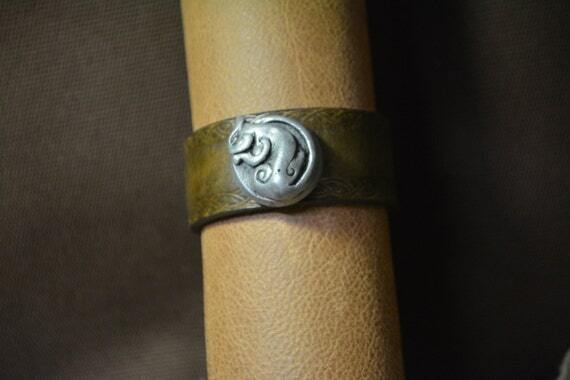 For any cat lovers on a lower budget the studio offers a range of gorgeous Steampunk leather bracelets including this cat design for just $20.